I’ve logged in tonight to post a couple more posts about Poland and I’ve noticed another milestone has passed – this is my 601st post since starting this blog way back in November 2008 – if you want to read that post click here for the link! Yikes – just did the maths – that’s 9 years!!! More moo cows and fences coming to Cannock Chase? Cannock Chase has a few owners : Staffordshire County Council, Forestry Commission, Cemex Quarries, etc.. and soon the RSPB. The County Council own most of the heathland – the bit mostly covered in purple heather if you know the Chase – Sherbrook Valley and Brindley Heath. The heathland is apparently a man made landscape, caused by years of grazing by animals on the common land in conjunction with the poor free draining gravely soil. During WW1 the whole area was large Army camp which also seemed to keep the heathland in place, despite the lack of grazing! Nowadays although many deer roam, the heathland is under threat from the development of trees in the form of naturally occurring silver birch (A Level Geography – Pioneer Species, Natural Ecological Succession I assume) bracken and wind blown pine from nearby Forestry land. With no grazing sheep to keep the young shoots under control up they come, together with eventually bramble. The natural succession I understand would take the landscape back to climatic Oak woodland as per Brocton Coppice but it would take a a very long time. Because the area is a SSSI (site of special scientific interest) the council are required by law to notify Natural England of certain activities (including recreational events) and also do nothing to endanger the flora and fauna on the site. Because some of the birds are protected it means they are I understand duty bound it seems to keep the heathland as is. They have tried all sorts over the years, cutting and bailing the heather, spraying the bracken, burning, selective cutting down of pines and silver birch and clearing bramble and the latest thinking seems to be to re-introduce the grazing. The trouble is it’s a recreational area very popular with dog walkers – dogs and sheep don’t mix and sheep are also a little high maintenance. 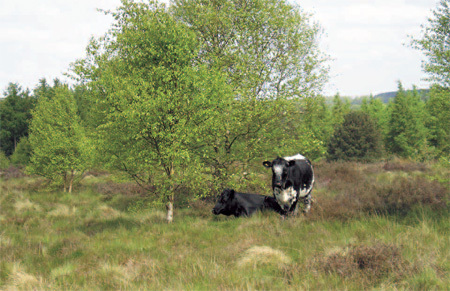 After some work done by Natural England with some environmental consultants and some experiments on Forestry artificial heath land corridors, Chasewater and Hednesford Hills the County Council now want to introduce docile cattle across the Sherbrook heathland – but how to stop them walking off? – fencing! Now they have decided their preferred route to preserve the landscape for the future is cattle, they need to consult on installation of fencing around the whole of the Sherbrook valley as understandably many people are up in arms even if just because its ‘change’. What’s proposed is a combination of traditional stock fencing with pedestrian, equine and vehicle gates, cattle grids etc and what is known as an invisible fence down the middle of the Sherbrook valley and cutting across to Seven Springs. This invisible fence consists of a buried wire which transmits a frequency which collars on the cows pick up, giving them a little shock if they get too close, keeping them in! To be honest the fencing doesn’t worry me, as long as the equine gates also allow mountain bikes and runners to pass easily and quickly I don’t think visually they will be a huge issue looking at the consultation map. To me though it’s the wider cost to try and keep what is essentially an artificial man-made landscape as it is now… I am not sure how it is being funded but essentially whatever method – EU, Central Government or Local Government funded, well over 13 KM of fencing is going to be an expensive and disruptive CAPEX and the upkeep of the cows and continuous other activities to maintain the fencing and keep down the silver birch and bracken will be an ongoing OPEX cost too. The fence will probably also need replacing every 25 years too. My view is the opportunity cost to other currently underfunded issues such as youth work, health benefiting recreation and social care funding etc. etc. cannot be balanced with the protection of an artificial landscape and a few species of ground nesting birds, no matter if they are protected. I know the Council is looking for volunteer organisations to take the load off the OPEX costs but again the volunteer effort comes with an opportunity cost. I think the natural succession back towards birch and then ancient oak woodland (which is also a valuable and protected habitat) should be allowed to progress over time – you only have to look at how the area around Milford Common and Marquis drive has regenerated in the last 50 years or so back to beautiful woodland. The Brits as usual sneaked off for a lunchtime café stop nearby following the middle race and a few of us returned to the mornings venue for the afternoon training – map memory. A blank map was given out to carry around face down on our map boards to act as a safety net, in-case we lost the plot, but essentially there was a 2 leg little bit of laminated map hanging from a tree at each control and you had to memorise your route. To be honest as we had been there in the morning and as we wound our way round again it was also a bit of terrain memory but excellent all the same. I tried 4 times to remember double legs, ie not stopping for two controls and memorizing the route the whole way. I managed it twice and had to resort to the backup map close to the control on two occasions to finish the leg. The area is crisscrossed by dedicated MTB singletracks and we had a great time too enjoying these outside of race conditions before heading back to base before heading out for a team meal.